Tucked away in a corner of our wine storage cabinet till yesterday, was a very special bottle, bought in Barcelona in December 2008. We had found the bottle at the famous wine shop Vila Viniteca close to the Santa Maria del Mar, and bought it purely on it’s reputation and the recommendations of the founders of Catavino, Ryan and Gabriella. If memory serves me right, we paid approximately 70 euro for the bottle. Safely back in Holland, the wine was allowed to rest, and was designated for a special occasion. Somehow, we kept postponing opening the bottle: the occassion was never special enough, it seemed. Until yesterday. Yesterday was one of those days that one plus one is three. First, it was my birthday; then Catavino send out an e-mail reminding us of Wine Blogging Wednesday #70. That, together with the warm wishes from Catavino’s Ryan and Gabriella Opaz for my birthday, did it: I knew with which bottle to celebrate my birthday ánd to take part in WBW #70, dedicated to Spanish wines. And so, after a simple but good meal, the bottle was opened. We had a chocolade cake for dessert, and were hoping that this wine would be a match with the wine. We were under the impression that it would probably taste a bit like Pedro Ximenez (PX). Well, it didn’t. And it did not combine with chocolate cake at all. But what a wine…. It’s color was bright amber, very clear. The smell was pure essence of pecan: very nutty, very pungent, not sweet at all (which I had anticipated…) The taste wasn’t like anything I have ever had before; it reminded us of sherry, of madera, but it clearly wasn’t, because the alcohol was lower and it was just… different. The wine was totally dry, with just a hint of caramel to tell us of a former sweetness. More sniffing let to descriptions of dried Chinese mushrooms, laurel, liquorice. Tasting led to wonder: there is alcohol, but it’s not fortified. It looked like it used to be a red wine, but there are no tannins. Acidity is good, but not very pronounced. What is this?….. Of course, we knew what the label said. Where it came from, and from what vintage. But that was it. We did not know what grapes it was made of, or the techniques used to make the wine. Well, I won’t prolong the suspense any longer. We tasted a bottle of Salvador Poveda Fondillón Gran Reserva 1970. Yes, that’s right, a wine from 1970: more than 40 years old! Fondillón is made of super ripe monastrell grapes (a red grape variety), in the area of the town of Alicante. If you find the mention ‘Alicante’ in old price lists of wine merchants (which I have), it will probably refer to Fondillón. The grapes are pressed, and the red skins remain in contact with the juice for a very limited time. This way, tannins in the wine are avoided. 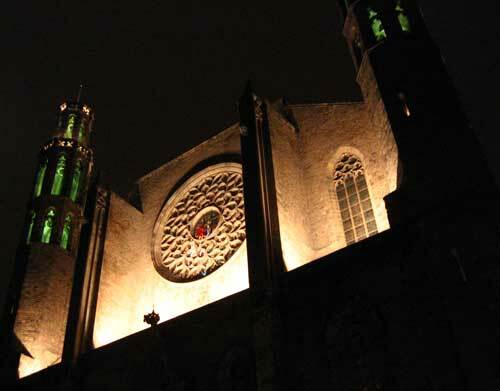 After fermentation, the wines ripen for a minimum of eight years in huge oak vats, and are oxidized on purpose. Eight years is only a minimum; twenty years of ripening is more likely. This type of wine is called ‘rancio’; some types of Banyuls (from the Roussillon in France) are also made this way. It seems that wines from different vintages are blended for a Fondillón, but this is not (yet) entirely clear to me. The 1970 vintage seems to be very special, in not being a blend; but if I read the information on the Poveda-website correctly, it is possible that our bottle of 1970 Gran Reserva contained drops of wines from decades and decades ago, back to the century before last. A bit of older Fondillón is always added to younger wines, if I understand correctly. Fondillón is not produced on a commercial basis anymore. It is simply too expensive, and too much of an acquired taste. What a shame! Because it tasted so good yesterday, as an digestif, but also today, as an aperitif, and even in combination with our food tonight. We had tartlets of chicory with blue cheese, walnuts and mascarpone, and to our very big surprise, the leftover Fondillón combined marvelously. The wine had mellowed out, smelled of honey and ginger now, and was a lot fuller in the mouth than yesterday. 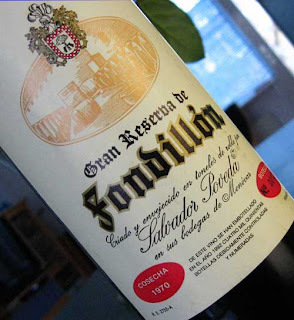 With this bottle of Fondillón, we have had a glimpse of the wines of old, enjoyed by our forefathers. Never tell me again that wine in ages gone by was not much to speak about. This one was simply amazing, and I hope that Poveda and the few other producers who still make Fondillón will keep on doing it. My only regret is that I could not share this bottle with you all, and especially with our hosts of this memorable edition of Wine Blogging Wednesday, Ryan and Gabriella Opaz of Catavino. Salute, dear friends, since to me you will always be part of the wonderful story of this amazing bottle of wine!